Only I would have had it with the tower top bottom and bottom top. I totally approve of the multi coloured glass. Looking good. The glass is a really nice touch. Nah I love the upside down shape !! It's different and challenges the conventional shape of towers. If it was the other way round would just look like a cylinder. Far more interesting the way it is ! Looks amazing! Thanks for posting Ryan. Has anyone checked to see if it overshadows the Yarra/Northbank (serious question)? Not a chance (of overshadowing being an issue) from back there Qantas. If the Yarra, at the point of the city runs east west, then how could something either north or south, create a shadow ? I know that would depend on the season with the sun rising further south in summer but that would not create the shadowing they the authorities are suggesting. Please enlighten me. We can add this tower to the growing list of buildings unlikely to ever see the light of day. Nothing wrong at all with council rejecting a developer proposal that cannot even specify how far into the public realm they want to project their building. The ongoing objections on this are NOT around height (sorry, you can put your broken records away). The main objections are around inadequate setbacks and apartment design. Particularly on the question of setbacks, this is council doing their job in ensuring the rights of all who may in future seek to develop adjoining sites, rather than merely privileging the site that happened to get its proposal up first. does everyone want wall to wall buildings in the hoddle grid with no penetration of light at all? people complain about hte overshadowing requirements on open spaces aren't people worried about the possibility of the entire grid just being in permanent shadow if we keep letting ever tower build to the boundary? I say it a lot but compare the setbacks on this tower to the 'classic' towers on the grid. 120, 101, rialto, melbourne central, Collins Place, Nauru House, chalk and cheese. What was the point of reducing the height of the tower to 215m when it appears that the design hasn't changed and nothing has been done to address the setback issues? Surely a tower with better setbacks that is taller, to compensate for the lost floor space, is preferable to a smaller tower without setbacks? As for overshadowing, "entire CBD in permanent shadow" is tabloid newspaper level hyperbole. The biggest issue is that FSR/PSR is no longer stringently adhered to or governed resulting in plot extrusions that can't provide the required setbacks. The FSR controls in the Melbourne CBD based on entire blocks rather than individual sites were always largely ignored because they were just unworkable and unfair. If you have reasonable, justified and enforceable setback requirements you don't need FSR controls. . The setbacks are inadequate and should be increased to a minimum of 5 metres from King Street, Little Lonsdale and the northern boundary and 3 metres from Nicholson Place. This could easily be done with conditions of permit. Some allowance should be made for the fact that the circular floor plate means that the building is less bulky and the average setbacks will be greater than the minimum setback. If it was a square floor plate the setbacks should be greater. MCC still recommending refusal for this one, despite the lower height and overall amended design. Another one for the never built thread. 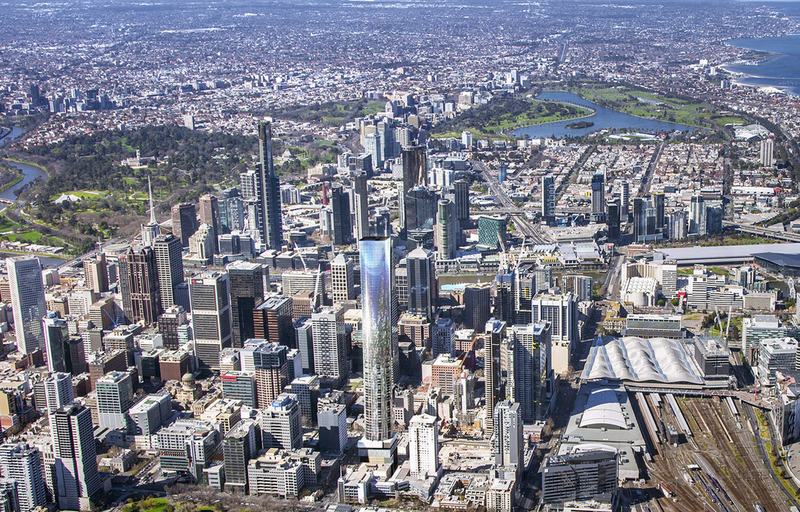 Developer Farinia has received development approval for its proposed 64-storey mixed-use tower at 295 King Street Melbourne. The project, which is predominantly residential, comprises two existing sites at the north-western corner of King and Little Lonsdale streets – an area earmarked by the Victorian Government for high-density urban renewal. It includes 431 apartments (one, two and three-bedroom) plus nine luxury penthouse apartments. Inspired by Brancusi’s ‘Bird in Space’ 1923, the development’s sculptural circular tower will become a unifying presence within Melbourne’s city skyline. The creation of meaningful connections has been an important guiding principle in this project’s design – it has been designed to make strong visual and contextual connections with its environment, and it also provides opportunities for building strong connections between its future residents. One level of the project has been dedicated to communal amenities and shared residential activities. At street level, where the tower’s circular form allows generous corner setbacks, the development will include both retail and laneway lobbies and cafes will spill out on to the street, inviting people in. The tower, with a facade of shimmering, iridescent glass, comprises three sections: the base, an upper, flared section that offers views of Flagstaff Gardens and beyond, and a central transitional section that connects the base to the soaring form above. Forgot about this one. Hope they push ahead with sales now but I won't be surprised if the site is for sale in a few weeks. Now THIS is a surprise! There you go, the sky isn't falling after all.